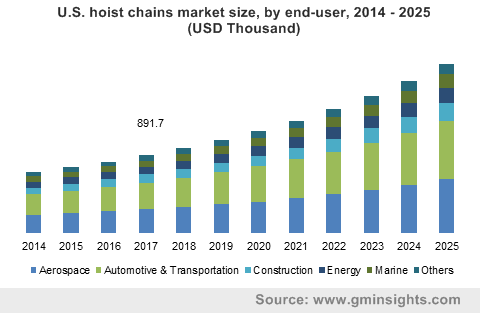 Hoist Chains Market size was over USD 4.5 million in 2017 and is projected to expand at over 10.0% CAGR over the forecast timeframe. Strong demand for material handling equipment in the aerospace & defense industry will boost hoist demand which in turn will have subsequent positive impact on the overall hoist chains market size in the coming years. Hoists are widely applicable for aircraft assembly/maintenance, to lift, turn and position large components on assembly line in warehouses & in cargo movements. Rising individual’s income & increased passenger air travel primarily in Asia Pacific is likely to boost the commercial aerospace industry in the region, which will trigger hoist demand and henceforth have positive influence on the lifting chains market size in the forecast timespan. According to the International Air Transport Association (IATA), India's domestic demand - Revenue Passenger Kilometers (RPK) was the highest among major aviation markets including Australia, Brazil, China, Japan, Russia and the U.S. Furthermore, region wise passenger proportion was estimated to be largest in Asia-Pacific which accounted for 33.6% of the total share, followed by Europe (26.1%), North America (22.8%), Middle East (10.7%), Latin America (4.5 %) & Africa (2.2 %). The abovementioned trends are likely to make a substantial impact on the hoist chains market size in the forecast timespan. Lack of skilled manpower to operate hoists is a major constraint, which is likely to hamper the overall hoists demand which in turn will have subsequent impact on the hoist chains market size in the coming years. However, rising product demand from several end-user industries such as mining, construction, automotive, aerospace, etc. will help generate significant growth potential for the overall lifting chains market size in the forecast timespan. In terms of volume, surface-hardened hoist chains share constituted close to 85% of the total industry share in 2017. Surface-hardened chains market is mainly driven by strong demand for electric/powered hoists from several end-user industries such as aerospace, automotive, construction, oil & gas, mining, etc. This segment constituted a larger market share as comparted to quenched & tempered hoist chains owing to its demand from electric hoist manufacturers which are progressively preferred across aforementioned industries. These chains are available in various diameters such as 4 mm, 5 mm, 5.6 mm, 6.3 mm, 7.1 mm, 8 mm, 9 mm, 10 mm, 11.2 mm, etc. However, there is strong demand for 7.1 mm, 11.2 mm and 6.3 mm surface-hardened hoist chains from hoist manufacturers, owing to their suitability in terms of strength for lifting and material handling equipment from end-user industries, which will help drive the overall hoist chains market size in the coming years. Hoist chains market size for aerospace industry will constitute approximately 25% of the total industry share in 2017. Rising electric/powered hoists demand from aerospace industry in Asia Pacific is majorly attributed to rapidly growing air traffic which is due to improving consumer lifestyles in the region. According to International Air Transport Association (IATA), Asia Pacific carriers experienced a growth of 8.5% air traffic rise in 2017. These trends will in turn trigger powered hoists demand owing to its rising applications at the assembling sites for lifting heavy components, which will propel product demand and have subsequent positive influence on the lifting chains market size in the coming years. 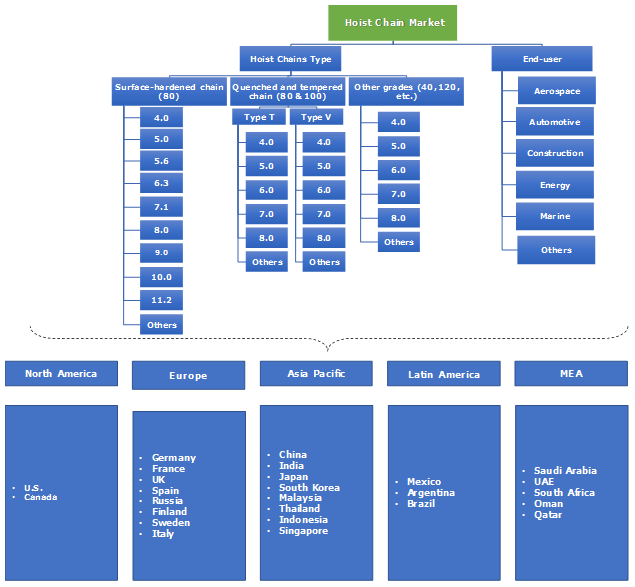 North America constituted close to 20% of the global hoist chains market share in 2017. This is mainly attributed to strong hoists demand from aerospace, automotive and oil & gas end-user industry in the region. Availability of abundant shale oil reserves and rising exploration activities in the region is likely to trigger hoists demand, which will have subsequent positive impact on the product demand, and thereby driving hoist chains market size in the coming years. According to EIA, U.S. has approximately 3.7 trillion barrels of shale oil reserves. Strong energy demand from transportation, power, household and various other sectors will result in rising exploration activities in the region. These trends will have positive influence on the material handling & lifting equipment demand and therefore will result in rising lifting chains market size in the forecast timeframe. Global hoist chains market is consolidated as the major hoist chain manufacturers constitute more than 50% of the total industry share. Some of the key hoist chains manufacturers in the market are Gunnebo, Peerless Industrial Group, FEC Corporation and J.D. Theile. Other players in the market are Weissenfels, Campbell, Retezarna A.S., McKinnon Chain, Atli Industry Co., Ltd., Juli Sling Co., Ltd., Force Chain, Hangzhou Modern Lifting Machinery Works, etc. Gunnebo constituted a share close to 15% of the total market share in 2017. The company is engaged in the manufacturing and distribution of lifting and material handling equipment such as crane blocks, wire rope sheaves, chain & lifting components, shackles, and lashing products. Furthermore, the company has manufacturing units in three countries and sales facilities in over 10 countries across the globe. Hoist chains are used across electric and non-electric hoist for lifting loads across various end-user industry including mining, automotive, aerospace, construction, energy, marine, etc. They are available in various diameter and grades (surface hardened and quenched & trenched) based on its strength which varies upon its application. Strong product demand for lifting equipment/component and material handling from various end-user industries such as construction, aerospace, mining, oil & gas, automotive, etc. in order to improve production line efficiency by reducing time and cost. These trends will boost hoists demand which will subsequently have positive influence on lifting chains market size in the coming years. There is significant increase in the air traffic mainly from Asia Pacific countries which is attributed to improving socio-economic factors and therefore rising air fare affordability. These trends have led to significant boost in the aircraft manufacturing which will propel product demand and will help witness promising gains to the overall hoist chains market size by 2025.